DAYTONA BEACH, Fla. (Feb. 10, 2017) – With the NASCAR K&N Pro Series East opener just over a week away – marking the official start to the 2017 NASCAR touring series season – the attention will return to the exciting on-track action. While there hasn’t been a race since November, it’s been a busy offseason. Beginning in December, NASCAR officials met with the car owners of all the U.S. and Canadian-based touring series, a move designed to further the dialogue between the sanctioning body and the teams. The conversations included covering some changes as well as an open discussion of how best to collectively grow the NASCAR touring series. · NASCAR announced today that Cherie Putnam will take over as the NASCAR Pinty’s Series director. Putnam, a native of Windsor, Ontario, has been involved in the sport for over 25 years. She was part of a Sunset Speedway championship and two NASCAR Pinty’s Series titles, and has worked the last five years as a NASCAR official. The NASCAR Pinty’s Series, the national championship for racing in Canada, will open the season on its traditional Victoria Day Weekend (Sunday, May 21) at Canadian Tire Motorsport Park. 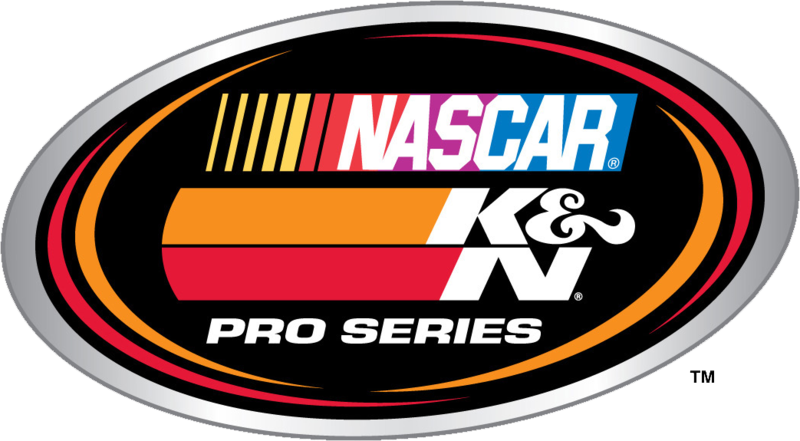 · Chris Wright was appointed to be the series director of the NASCAR K&N Pro Series. Wright, who has been the director for the K&N Pro East since 2013, will oversee both the East and the West. In addition, Andy Mitchell will become the head technical inspector for both the East and West, as NASCAR continues to align the top developmental series. Jimmie Walker was named the race director for the K&N Pro West, while Les Westerfield will continue in that position in the K&N Pro East. · Following the format change set forth by NASCAR’s three national series, NASCAR’s four U.S. and Canadian-based series will switch from a green-white-checkered finish to an overtime line for its races. The location of the line will be determined on a track-by-track basis, and will typically be entering Turn 3 on ovals. If the event goes past the advertised distance due to a caution, on the restart, if the leaders reach the overtime line before another caution comes out, it will be considered official. If the caution comes out prior, the race will have another restart. · Starting with the K&N Pro Series East opener at Florida’s New Smyrna Speedway on Sunday, Feb. 19, NASCAR announced the move to group qualifying on ovals. There will be single-car qualifying at select events, like the NASCAR Whelen Modified races at New Hampshire Motor Speedway. Qualifying groups will be set by practice times. · The NASCAR K&N Pro Series East and West, and the NASCAR Pinty’s Series schedules will feature a unique format for one of its events in each series: Twin 100-lap features. The NASCAR K&N Pro Series West will be first up at California’s Irwindale Speedway. The NASCAR K&N Pro Series East will run twins at Virginia’s South Boston Speedway, and the NASCAR Pinty’s Series will do so at Wyant Group Raceway in Saskatoon, Saskatchewan. The starting lineup for the second 100-lap race will be determined by the fastest lap run in the first race. · The NASCAR K&N Pro Series West doubleheader is part of four races at three tracks in seven days to kick off the season that includes a $100,000 NAPA 500 Challenge bonus award if a driver wins all four races. The season opens at Tucson Speedway in Arizona on Saturday, March 18. · Earlier this month, the NASCAR PEAK Mexico Series announced its 12-race schedule. Made up of six ovals and six road courses, the national championship for stock car racing in Mexico will open on Sunday, March 26 at Autódromo Monterrey, a 2.1-mile road course in Apodaca, Nuevo León. The series held an exhibition event in December following the announcement of a multi-year agreement with Old World Industries (OWI) to make PEAK the series entitlement sponsor. · The NASCAR Whelen Euro Series announced a date change for its race at the prestigious Hockenheimring. The American Fan Fest will now be held July 29-30 and conclude the series’ regular season before its two rounds of playoffs. The NASCAR Whelen Euro Series will open on April 8-9 at Valencia, Spain. The series, though, will have a number of drivers competing in the U.S. during Speedweeks, most notably two-time champion Anthony Kumpen in the NASCAR XFINITY Series race at Daytona International Speedway and 2016 Elite 2 champion Stienes Longin in the PPG/Tower Sealants Pro Late Model 100 as part of New Smyrna’s 51st World Series of Asphalt Stock Car Racing. · NASCAR has implemented mandatory pre-license drug testing for drivers in all its U.S.-based touring series as part of NASCAR’s evolving substance abuse program. · Earlier this week, Safety-Kleen, the Official Environmental Services Supplier of NASCAR, was announced as entitlement sponsor for the first race of the new unified NASCAR Whelen Modified Tour. The race, at South Carolina’s historic Myrtle Beach Speedway, will be the Performance Plus 150 for Safety-Kleen’s new brand of high-quality, high-performance motor oil. NASCARHomeTracks.com will continue to be the digital home of all the NASCAR touring & weekly series, including Spanish-language content of the NASCAR PEAK Mexico Series. Fans can also follow the news and action on Twitter at @NASCARHomeTrack and through the designated series hashtags: #KNEast, #KNWest, #NASCARPeak, #NWES, #NASCARPintys, #NWMT and #NWAAS. SACRAMENTO, CALIFORNIA (February 10, 2017) - The Pacific Challenge Series presented by PenneyLawyers.com has confirmed the ninth date for its 2017 campaign, to bring the touring Super Late Model series to four tracks signed for the upcoming season. 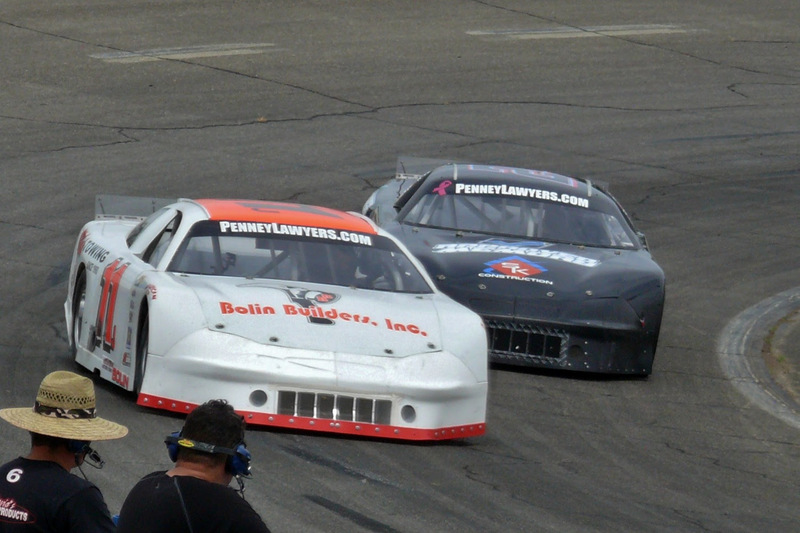 The PCS will return to its largest track at Anderson, CA's Shasta Speedway on May 6. It will mark the seventh time PCS has raced at the 3/8ths mile located on the Tehama County Fairgrounds. Tracy Bolin of Valley Springs earned his first career series win when he topped two-time series champion Jeremy Doss in a thriller last June. The most successful driver at the track is arguably Eric Schmidt of Roseville, with multiple victories in both Open Show races and PCS events. Schmidt won all four PCS races at Shasta in 2013 en route to the series championship. He looked poised to win the 2016 event before a late race tangle with Doss ended his race on lap 77. Schmidt also won the Memorial Day weekend Tri-Holiday race at Stockton for a strong partial season with PCS. Pacific Challenge Series officials anticipate adding one additional race to complete the 2017 series calendar. Racers will take on five different race tracks ranging from quarter-miles to 3/8ths miles in one of the most competitive series on the West Coast. Bakersfield, CA – Pinnacle Peak Steakhouse of Colton and San Dimas is a proud sponsor of the 2017 Winter Showdown at Kern County Raceway, for the second year in a row. The southern California based restaurant will be part of both days at the 2017 Winter Showdown, as they will sponsor the “Pinnacle Peak Steakhouse Fast 12” on Friday night and on Saturday they will award the Hard Charger of the Winter Showdown 250 a $1,000 bonus. The Pinnacle Peak Steakhouse Hard Charger Award is new for 2017, which will be awarded to the driver that advances the most positions from his or her original scheduled starting position. The format to qualify for the Third Annual Winter Showdown will begin with single car qualifying at 6:30pm on Friday, February 10th. The fastest 12 drivers from qualifying are locked into the Winter Showdown 250, with the fastest driver claiming the Bobby Durrett Fast Time Award and a $2,000 cash bonus. The top 12 qualifiers will then compete in the “Pinnacle Peak Steakhouse Fast 12” to determine the top 12 starting positions for Saturday’s 250. Starting positions 13 to 31 will be set by the Race For Autism Qualifying Races, in which the balance of the field will be split into two Qualifiers, with the top 9 finishers from each Qualifier locked into the big show. The Winter Showdown week starts on Thursday, February 9th with a Kick-off Party presented by Visit Bakersfield at the Buck Owens’ Crystal Palace at 2800 Buck Owens Boulevard in Bakersfield. The Winter Showdown Kickoff Party will also feature the 2016 SPEARS Southwest Tour Series Top 10 award presentations and live music by the John Hollins Band. Friday, February 10th is “51 FIFTY Energy Drink Opening Night” featuring Super Late Model qualifying Lucas Oil Modified Series “Spray Nine Race of Champions – Top 9”, the “Pinnacle Peak Fast 12” and the Race For Autism Qualifying Races. On Saturday, February 11th it’s the Lucas Oil Modifieds “Spray Nine – Race of Champions 50” and the $30,000 to win “SPEARS Manufacturing Winter Showdown 250” for the Super Late Models. For more event information, go to the “Winter Showdown” icon at www.SRLSouthwestTour.com. Winter Showdown general admission and reserved seat tickets are on sale now at http://www.kernraceway.com/2017-winter-showdown-tickets. 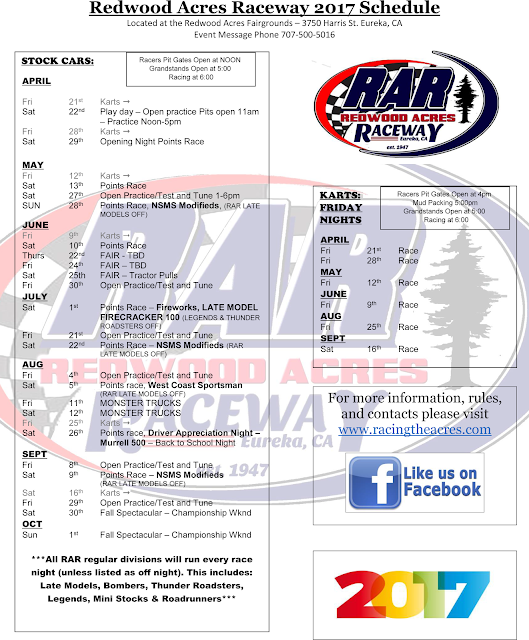 Eureka, California’s Redwood Acres Raceway has released its tentative schedule for the 2017 season. 13 dates are listed between the months of April through September with the schedule still in the process of being finalized. The third-annual Firecracker 100 late model race will take place Saturday July 1st. At the conclusion of the night’s races, RAR will also a fireworks display which have been real crowd pleasers in the two previous years. In addition to the local cars, Redwood Acres Raceway will host several touring series events in 2017. The ever-competitive North State Modified Series will return to the Acres for the third straight season for three visits. The NSMS event is a special Sunday-evening affair on Memorial Day weekend May 28th. The mods return on Saturday July 22nd and then for the final time on Saturday September 9th. Another highly anticipated event will be the debut of the West Coast Sportsman Series at RAR on Saturday August 5th. The series is in its inaugural season and features Grand National-type cars that formerly raced in NASCAR’s K&N West Series. The Acres is one of only two paved ovals currently on the 2017 West Coast Sportsman Series schedule so the event will be something not to be missed. Outlaw kart racing will return to Redwood Acres Raceway in 2017. Six races are scheduled with the opener on Friday April 21st and the finale on Saturday September 16th. All races for the outlaw karts will be non-point paying events. Acres management is still in the process of finalizing potential dates for the Redwood Acres Fair but does have Tractor Pulls scheduled for Saturday June 25th. Friday August 11th and Saturday August 12 will be the annual monster truck show in the Acres infield. The 2017 season concludes with the Fall Spectacular and the crowning of champions in roadrunners, bombers, mini stocks, Legends, Thunder Roadsters and late models. It should be another fantastic season of racing at the Acres in 2017. For more information, please visit the track’s official website www.RacingTheAcres.com. Bakersfield, CA – On the eve of the biggest race weekend of the entire year, Thursday, February 9th, the Buck Owens’ Crystal Palace will host the “2017 Winter Showdown Kick Off Party presented by Visit Bakersfield”. Open to the public, with no ticket required, the “Winter Showdown Kick off Party” will feature live music featuring the John Hollins Band, driver interviews, raffle items and the presentations honoring the top drivers of the 2016 SPEARS Southwest Tour Series champion season. As always, the Crystal Palace will be serving their legendary dinners and both bars will be open. All Winter Showdown race teams at the Kickoff Party will be entered into a raffle, with a chance to win Traeger grills, LED TV’s, VISA Gift Cards, Five Star Race Car Body and more. For tickets and information go to www.kernraceway.com.